The U.S. Mint in Philadelphia struck large cents continuously from 1792 until 1857. There is only one gap in this period of time. There were no large cents struck in 1815. This is because the U.S. imposed an embargo on British goods and so could not import the copper planchets the mint needed to make these coins during that particular year. The earliest large cents feature Lady Liberty on the obverse, first with flowing, somewhat messy hair, then with a “liberty cap,” followed by what is known as the Draped Bust Lady Liberty. The three most valuable early large cents are the 1793 Flowing Hair cent, the 1793 Liberty Cap cent, and the 1799 Draped Bust cent. 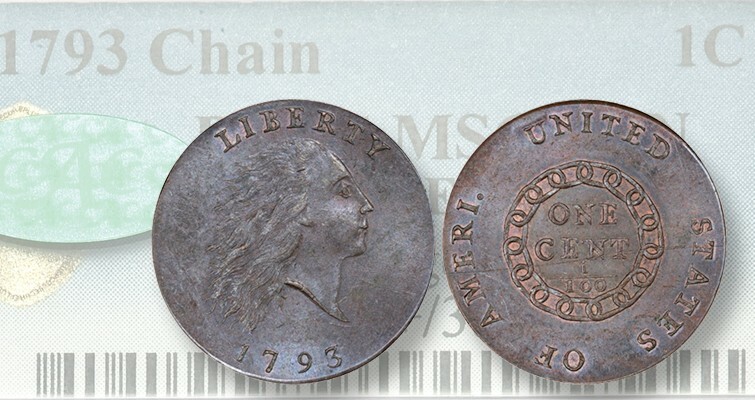 The 1793 Flowing Hair cent is a very valuable coin. Just this month one sold at FUN for $1.5 million dollars! In uncirculated condition, each one of these cents is worth a fortune. But even if you don’t ever see or touch one of these three coins, it’s still very enjoyable to collect large cents. They are very popular as early examples of American coinage, illustrating via copper how the work of the U.S. Mint changed over time as the nation itself evolved and grew. The last large cent was minted in 1857, which means all the large cents date back over 160 years to the pre-Civil War United States. The 1857 Lady Liberty no longer looks like she’s been through a storm. She is elegant and beautiful. Her face is serene in profile, she wears a hairpiece in her upswept hair that reads “Liberty,” and 13 stars are arranged in a semi-circle around her head. In 1856, the small cent appeared for the first time, succeeding large cents and half-cents. These copper cents are what we recognize today and call “pennies,” although they themselves went through many forms, including the Flying Eagle, the Indian Head, the Wheat Ears and the more familiar Lincoln Memorial cent. If you would like to add large cents to your collection or are interested in locating and purchasing any of the American cent coins, we at Mullen Coins would love to help you meet that goal. Call us at 616-272-4402 to set up a meeting to discuss your collection.